About the story, tips, tricks and so on… reading speed, general storyline oke, assumptions, popular book or not, subject like it or not. 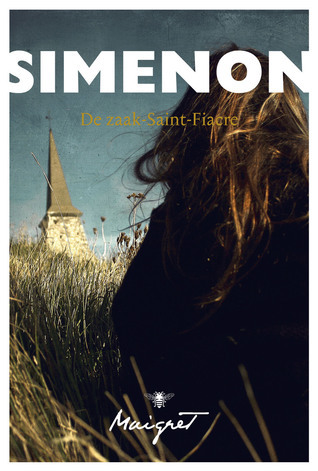 In this sequel in the commissar Maigret series, Maigret visits his birthplace Saint-Fiacre. Based on a note he receives he goes back to this idyllic village. He recognizes some of the people, the buildings and the characteristics of the village. The count of Saint-Fiacre, the estate of Saint-Fiacre and the church play a big role in the daily life of the village people. He hopes that the fact on the note he received in his office in Paris, will not come true. He hopes the idyllic village stays idyllic an the way how he remembers his childhood. At first the story seems quite simple but the further you read, the more complex it gets and even a genius plot in such a way revealed that is quite unique. Maybe even completely unique for the time this book was first published in 1932. The writing style of this Maigret sequel was how I expected it. Georges Simenon explains simple complex connections without making the connections simple. Halfway the book the tempo speeds up and more information is added more quickly but not interfering with each other. Things are happening faster but in your imagination Maigret keeps on walking in the same pace. The main character is of course commissar Jules Maigret. Through this sequel you get more information about the childhood of the commissar and his habits back then. Side character Marie Tatin is an classmate from his youth and runs the local pub (bed & breakfast at that time). Other characters are the Countess of Saint-Fiacre and her son count Maurice de Saint-Fiacre, the priest, Gautier senior the steward, his son Émile Gautier, Marie Vassiliev, Mr. Tallier, Jean Métayer, Dr. Bouchardon and Ernest an altar boy. The side characters differ from shallow to elaborated good characters, depening on their role in the story. So I can’t say too much about that because then I would reveal some connections. The way Georges Simenon writes and places his character, is like a theatre play. They come and go on their own time and when they reappear now and then it is the game of: who did what when? I hope you like the book too. It is worth to read it! I am not telling about the story too much, you have to read the book yourself and make your own opinion. On the page ‘Affiliate‘, I explain why I am an affiliate of a few businesses. If you click on one of the buy-links I provide, or stay in the shop through my link, I get a few % commission. And you get your product, maybe with some sale %! It is a win-win situation!